The publisher World Wisdom has a “Perennial philosophy” series which contains “Traditionalistic” books. Earlier I reviewed The Essential Ananda K. Coomaraswamy. Among the series are a few titles with texts by different writers, usually ‘old’ and ‘new’ writers. For that very reason, I wanted to read one of these books and my choice fell on this title. After a nice introduction by the editor Harry Oldmeadow, Frithjof Shuon opens the first of five sections (Tradition and modernity) with an essay called No Activity without Truth. The following text by René Guénon comes from The crisis of the modern world so I already knew it. Two new writers to me complete this section, Brian Keeble and Kathleen Raine with respectively Tradition and the individual and India and the modern world. The second section is called Perennial thruths and modern counterfeits. Rama Coomaraswamy, Karen Armstrong, Timothy Scott, M. Ali Lakhani and Rodney Blackhirst can be found here. The subjects are Ancient beliefs or modern superstitions (a great and very critical article), Faith and modernity, The logic of mystery and the necessity of faith, “Fundamentalism”: a metaphysical perspective and Rudolf Steiner, Anthroposophy and tradition. The social order is the title of the third section. Of Ananda Coomaraswamy one of his “bugbears” is presented (The Bugbear of Democracy, Freedom, and Equality, a very nice text), Patrick Laude speaks about individuality, Fatima Jane Casewit about feminism and Islam (“The feminist movement in the West is centered on woman in this world and right which she is able to obtain here and now. A woman’s relationship with God and eternity are not taken into consideration.”), Roger Sworder and Dorothy Sayers about working our society and in the past and Robert Aitken gives his views on the future in a short essay. I didn’t like the fourth section about science too much, even though two writers for whom I bought this book are in this section: Seyyed Hossein Nasr and Titus Burckhardt. The other writers are Wolfgang Smith, Theodore Roszak, Mary Midgley and the last ironic essay of Brian Coman about death is the only enjoyable piece in this section. The last section (The destruction of traditional cultures) mostly contains short texts. Thomas Yellowtail speaks about ‘Amerindians’ and how their culture changes in the modern, American culture. Anagarika Govinda about The fate of Tibet, Cowan about dreaming, mostly in relation to Aborginals. Philip Sherrard took care off the epilogue. I was positively surprised that there is quite some stress by the writers on the fact that us modern people forgot how to live ‘religiously’. The subtitle of the book is treated properly. Much stress too, is there on how how we see work “A. Coomaraswamy quotes A.J. Krzesinkski saying: “These workers look on labor as a necessary evil, as an opportunity to earn money which will enable them not only to supply thier essential needs, but also to treat themselves to luxuries and give free rein to their passions.” A very true statement. Quickly follows a quote of Jean Giono saying: “the workers work for forty hours a week. I would rather that they did not have to work for one hour at all, but be able to work a hundred hours doing something that interests them.” Also very present is the subject of individuality: “…the “individual” seems to have become a substitute for the sacred.” (Laude) and the uselessness of ‘important’ things of our society: “The factories are roaring more loudly than ever, turning out night and day goods that are of no conceivable value for the maintenance of life” (Sayers). The book surely gives things to think about. 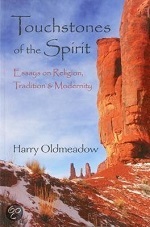 It is more focussed on our present day and time than “Traditionalistic” books of a few decades ago. On the other hand, I don’t have the impression that all writers included can be called “Traditionalists”, but that Oldmeadow just took their texts because they fitted in the framework. The book is a strange anthology of essays, lectures, chapters from other books, etc. There is some kind of ‘red line’ that runs throughout the book but the writers, their backgrounds and their writings are so differentiated, that you really have to consider each text itself. All in all a nice read. In a way this could be an introduction to “Traditionalistic” thinking for people not familiar with it, the book can surely be read by people who are critical about the Western society, but do not have “Traditionalistic” tendencies, and people who (like me) are in a way well-read have the possibility to read a few things by different writers.